NABA 2.0 is an innovative interactive dance work set in a museum’s galleries, inviting audiences to be an active part of the performance by choosing their own soundtrack using audioguides. 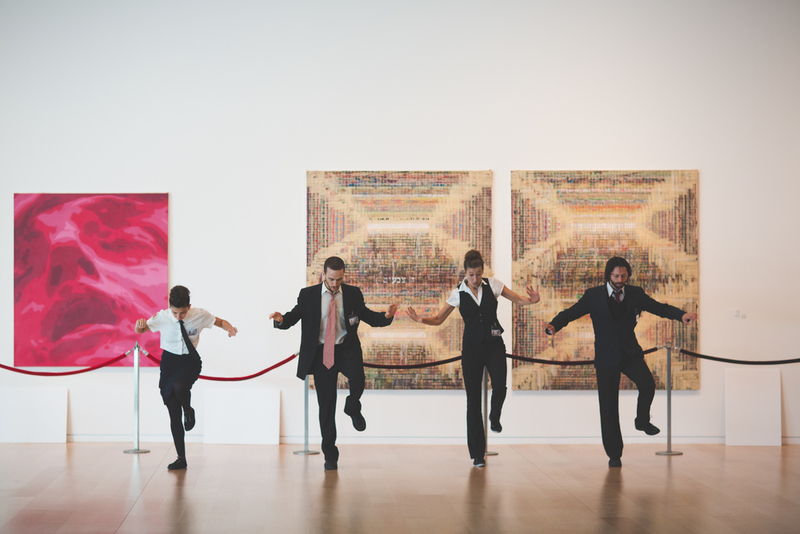 The performance is led by four unusual “museum guards”, who take viewers on a choose-your-adventure journey, animating the artworks and architecture of the museal space. 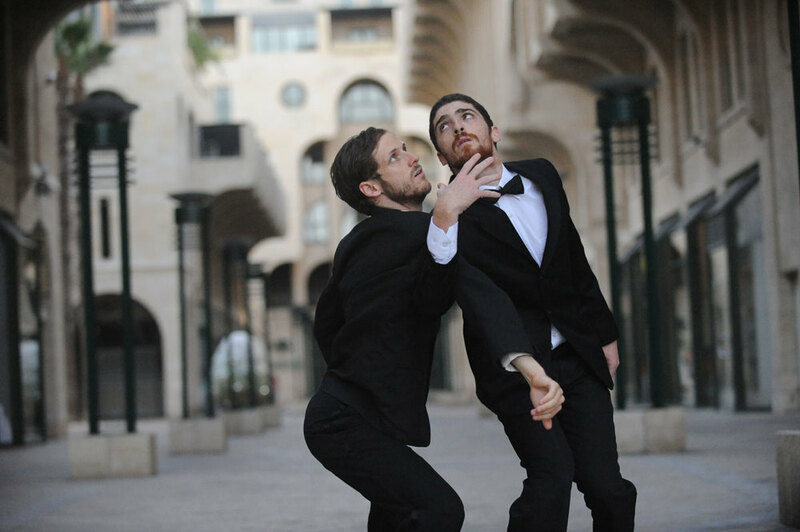 The work premiered in 2013 at the Tel Aviv Museum of Art and has since toured across Israel and is now in residency at the Israel Museum in Jerusalem. Each viewer is handed a specially pre-programmed audio guide with a personal set of headphones. The device is loaded with numbered audio tracks. The show is divided into chapters. Upon instruction from the performers, each viewer can choose which track to listen to. The sound for the performance comes exclusively from the headphones, as opposed to outside speakers, allowing – upon their choice – for two viewers standing shoulder to shoulder to simultaneously listen to different tracks. Audio tracks range from various musical selections and audio clippings, to original texts and other unexpected surprises along the way, all inspired by and reacting to the specific museum setting. What the viewers hear will inevitably change how they see. For every museum, the choreography and audio selections are reworked and adapted. The audio tracks are designed to inform and alter everything that fills the viewer’s prism: from the unique architectural attributes of the space and its history, the art works present, to the artists behind the works, the performers in front of them and more. 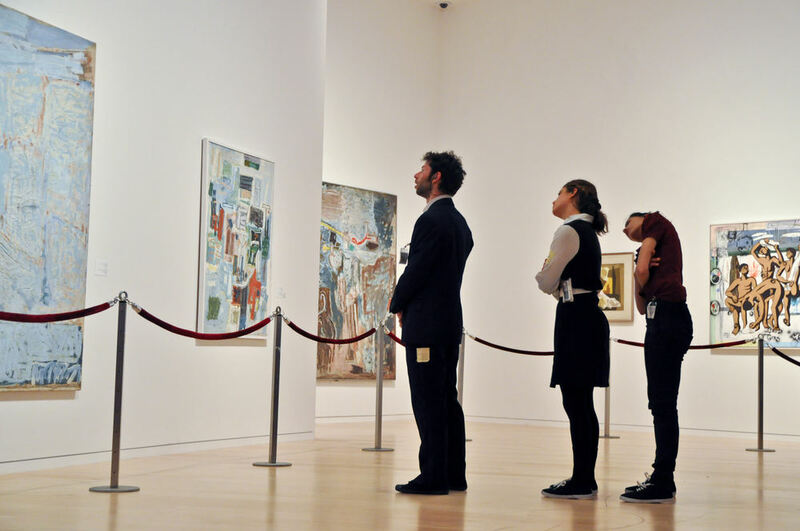 We research the exhibition and spaces in which we perform, and collaborate with the museum’s curatorial team to collect the relevant materials.The choreography is set to correspond to and engage with the space, the artworks and the audio choices. 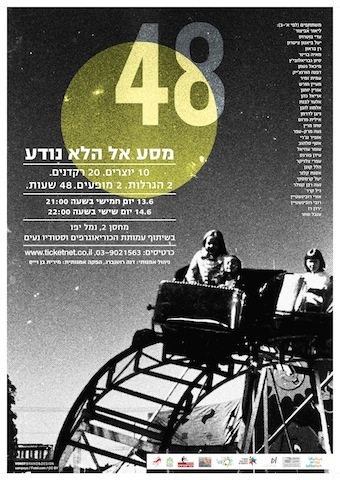 Original Cast: Inbar Nemirovsky, Gil Kerer, Einat Betzalel, Idan Porges. The brilliance of the new version is based on the choice of space - the Israeli gallery of the Tel Aviv Museum - as the new meeting point, and to that aim Ruttenberg has created brand new choreography for four dancers. As in the past, she again succeeded in creating a polyphonic multi-faceted dance work, which very different musical scores illuminate in unique ways. In an underground hall, a dream team convenes: a “veteran” dancer turned mother, a man in his sixties, a physical therapist who hasn’t performed in a decade, a dancer at the height of his early career and one choreographer. In the intimate space, all their dreams and nightmares about life are conjured up: life on stage and behind it. Everything that has gathered, everything that has expired, everything that will never come true, are stirred into one sweet and sour cocktail. It is a sober, humoristic and heartfelt look at the fantasies that allow us to travel through time and space - forward into the future or back into the past. Premiered at Curtain Up Festival 2010. Private I’s investigates the boundaries of masculinity, and the forces that operate on the male body, while borrowing from different cultures and modalities. The movement language is infused with different inspirations, from martial arts to slapstick, from Hollywood to Cabaret, while counterbalancing it with the mundane “every day” gestures of male bonding.The original music by Noam Inbar and Adam Scheflan reacts to music from different cultures praising the hero warrior, be it the man in the jungle, or James Bond. The work is available both with live music and with recorded music. 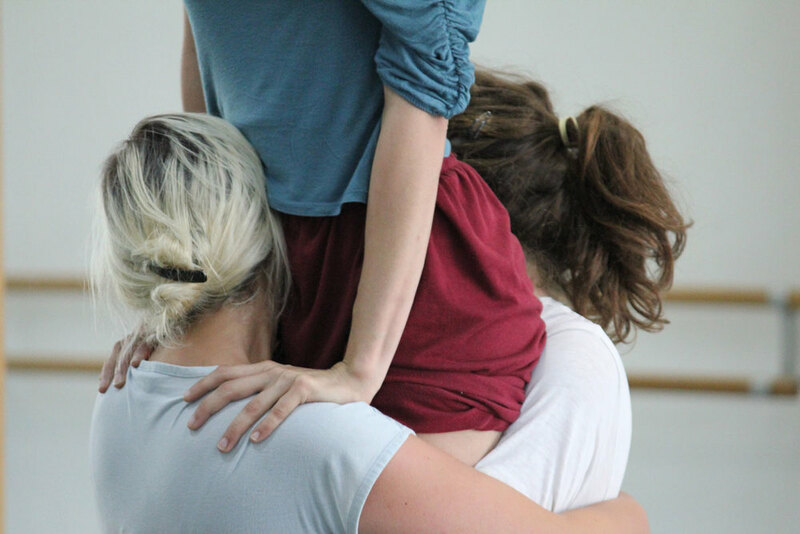 PROJECT 48 DANCE invites choreographers, dramaturgs, dancers and other Artists to two 24 hour "speed-spin-blind-dates" culminating in 10 one-time-only dance works. The project was inspired by preceding projects in Film, Theater and Architecture, and is the first of its kind in Dance. The game consists of two 24 hour "rounds" of creation: An initial raffle determines the creative teams. Each group comprises of a choreographer, a "Second Eye" (Dramaturg/Director/Dance Researcher) and a varying number of dancers. Next, the parameters for creation are drawn. These include spatial and thematic constrictions/challenges. From then until the public showcase, each team has 24 hours to create a Dance work to be performed live. The rehearsal project is documented by a photographer and videographer. Videos from the rehearsal studios will be streamed live, and the still images will be showcased for the audience pre-show in a "Pop-Up Exhibition". Now more than ever we encounter our need for community. We experience it in our lively activity in social networks as well as the growing social discourse around us. We are thirsty for dialogue with one another towards some common interest. Artistically speaking, when there is no community, competition takes its place. Competition breeds seclusion, and each artist finds him or herself "entrapped" in the familiar. Here, the element of chance and the short process pushes towards new combinations of artistic forces to occur, and creative blocks to be smashed. Each of the "players" can safely peek out - or completely leave behind - their comfort zone and re-imagine his or her range of exploration for these two days. 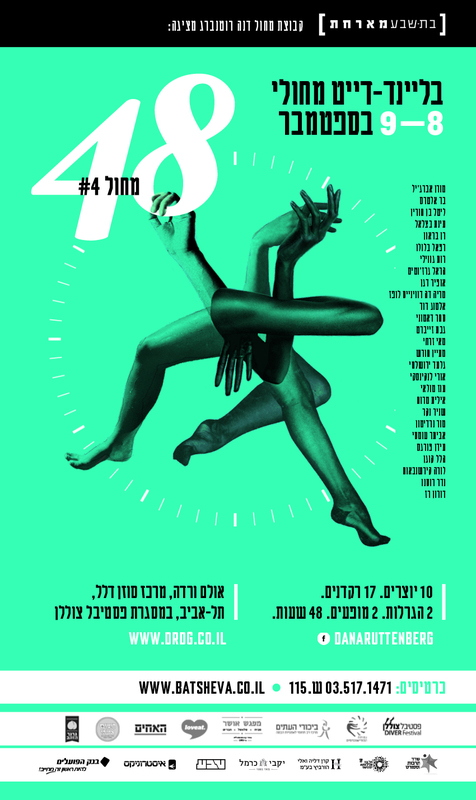 The fifth edition will take place as part of the Batsheva Hosts series and in collaboration with Kibbutzim College. Get your tickets: October 26-27, 2017. God Forbid is an autobiographic performance work by Dana Ruttenberg and Noa Mark-Ofer, performed by Noa. The performance is based on Noa Mark-Ofer’s true story. Apart from being a dancer, a curator and a juggler of many other roles, Noa is also a mother that one day learned that her baby son is very sick. Noa's appearence can be a "deceptive". Upon meeting her, you can't help but ask yourself if she is what you had in mind when you thought of a "mother of a sick child". What DID you have in mind, by the way? During the performance, the audience are invited to participate in different ways and become an inseparable part of Noa’s world. They are the doctor sitting across the table, they are her son and daughter, and at times they even become Noa herself. The performance space becomes a topographical and psychological map of her cosmos comprising obstacle courses, medical corridors, physical rooms and inner chambers of the heart that. In a new language full of words that are unpronounceable (she is already an expert, we are still novices), a treasure trove of human explosives is revealed. This is an autobiographical strip-tease. Flirtatious, exposing, inviting, empowering, exhausting. And it is everything you didn't expect to encounter. Or want to. Dana is the co-founder of ScreensArt, a production company devoted to dance fims and dance video art works. You can read more about it at www.screensart.com. 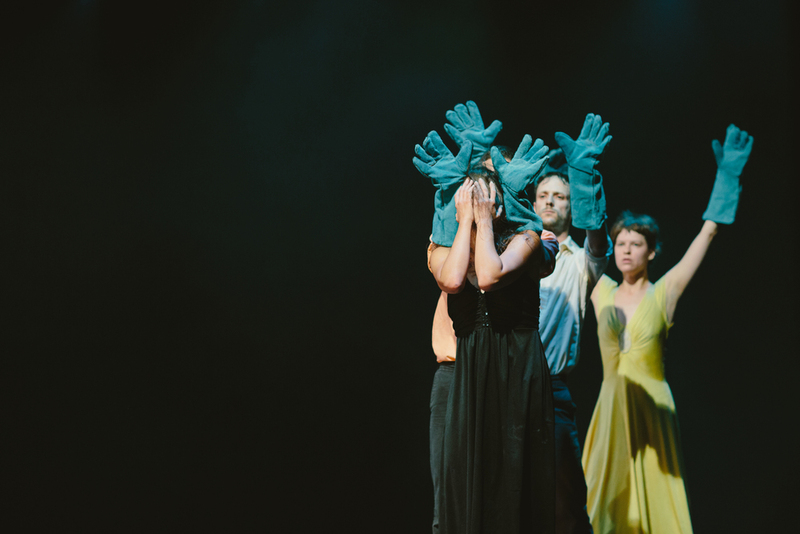 "Glove Story" is the second collaboration between choreographer Dana Ruttenberg and director Oren Shkedy. The film explores the notion of personal space and the all-too-often invasion into it. It asks the question: what are the psychological, physical and social repercussions of treating bordersasmere suggestions? This question echoes much stronger in the local political climate of our region and of our times. The film follows four characters through a series of hyper-realistic topographies and architectural settings in which, like in Sartre's “No Exit”, individuals are one another's heaven or hell. The gloves are the recurring object, a thin line of protection – which also gives its wearer “permission” to penetrate another's space unharmed. The film follows the construction, eruption, corruption and destruction of the masculine self and other. It investigates the boundaries of masculinity, and the forces that operate on the male body, while borrowing from different cultures and modalities. The movement language can be traced to traditional forms and concepts integral to martial arts. It translates it into a contemporary individualized expression in different ways, while counterbalancing it with the mundane “every day” gestures of male bonding. FIVC Festival Internacional de Videodanza de Chille, 2012. + International FIVC tour, Buenos Aires, 2012.
International Screendance Festival, USA, 2012. Winner of Award of Distinction. Jumping Frames International Dance Video Festival, Hong Kong. Winner of Outstanding International Dance Video Award. 2012. Quinzena de Danza de Almada Festival, Portugal. 2012. Columbus International Film and Video Festival, Ohio USA, 2012. Winner of Honorable Mention Award. Dance Camera Istanbul, Turkey, 2012. Dance on Camera Festival, New York, 2013. NU2 IDN Festival, Barcelona, 2013. 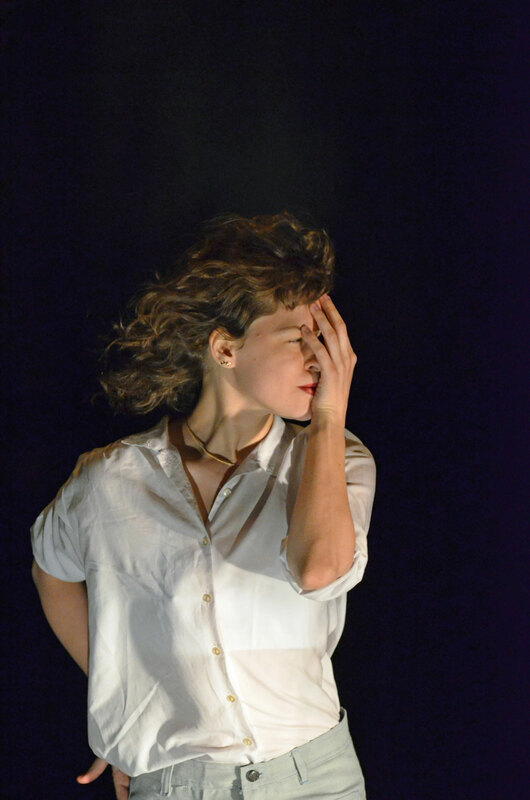 Israeli Contemporary Dance Week, La Mama Theater, New York 2013. LOIKKA Dance Film festival, Helsinki, 2013. La Maison, de la cave au grenier, Montreal, 2013. Dance Camera West, Los Angeles, 2013. Winner of Audience Choice Award. In The Palace, Sofia, Bulgaria. 2013. Special Mention. Premiered at Curtain Up Festival 2012. ARMED investigates personal space and the all-too-often invasion Into it, that we experience in Israel. It suggests a different, perhaps more critical, interpretation to what we have come to think of endearingly as warmness, and asks the question of what happens to us (physically/psychologically and socially/ politically) when we consider the notion of borders as fluid, or when we take ownership of what is not ours to have. A trio inspired musically by J.S.Bach's Chaconne in D Minor and thematically by the concept of optical illusions. The piece reacts to the structure of theme and multiple variations in which the Chaconne was composed, the meditative-obsessive repetition of its base line, the repeated harmony and its representation in dance. Just as visual multi-stability can be evoked by visual patterns that are too ambiguous for the human visual system to recognize with one unique interpretation, the idea is for the piece to create the trigger for viewers to use their innate perceptual organization to make sense of the visual and musical stimuli. POLY has three casts, one of all female dancers, one of all male dancers and one mixed cast. A “solo for two performers” examining loss and memory as integral parts of the creative process. The accompanying text is a reading of Samuel Beckett’s “Text for Nothing #8”, part of a series in which the writer sums up his philosophy of art through the spoken voice of the text itself. Beckett’s text brings to question man’s ability to locate himself within the cosmos or time, in a nightmarish vertigo of identity and self. Dance as an art form deals constantly and unavoidably with memory, as it exists only in the present and in the way it is carved into memory. The act of moving, as opposed to painting, involves memory in its vey core. every movement is “lost” a mere moment after its execution. The work presents two characters in mourning, as the dive into memory in different, yet colliding, ways. Images from the Israeli/Jewish rituals of memory (the memorial day siren, the candle of memory) intertwine with old family footage, and a personal text naming all those things that are lost forever. 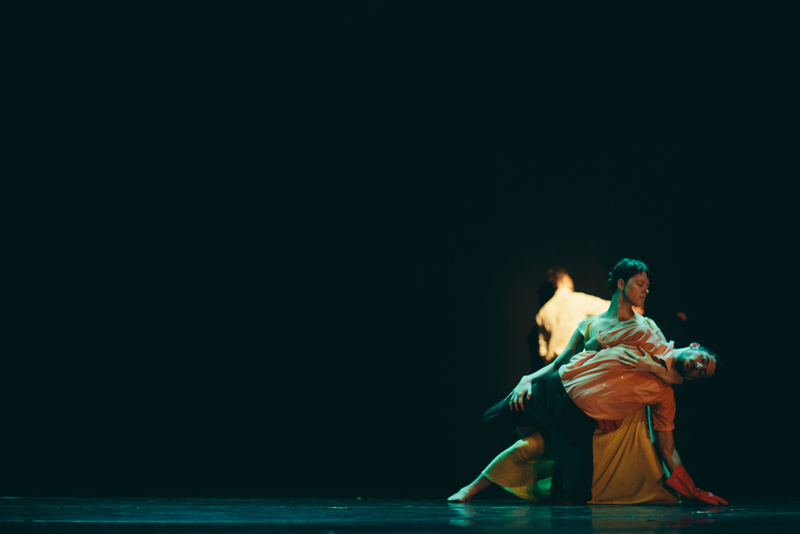 Premiered at IntimaDance Festival 2012. 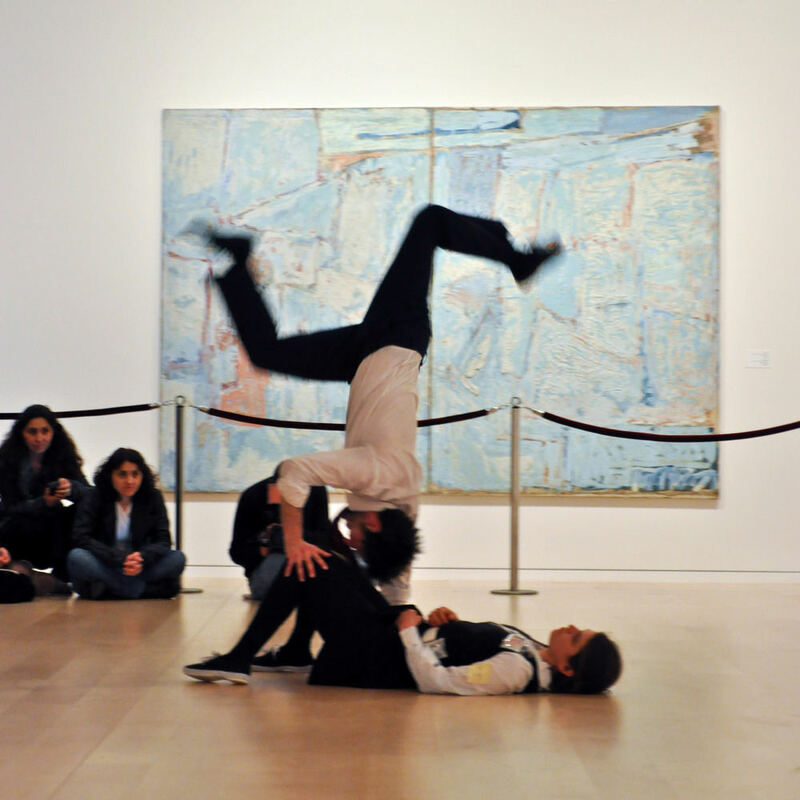 Curated by Dana Ruttenberg, SERET NA was a weekend of Dance, Film and everything in between. Ruttenberg turned the space into a cinema, in which througout the weekend there were screenings of Dance Films, Artist Panels, an exhibition of Dance Video Art, interactive Dance Consoles, screening of rare historical footage from the Israeli Dance Library, and Silent Dance film events for adults and children alike.